Mornings can be stressful, no matter your age or season of life. But when you add kids into the picture, it’s a whole different story. You can’t just hit snooze and roll over. Now you have to worry about getting the kids ready in addition to rushing through your own morning routine, which suddenly got a lot shorter. A bowl of sweet cereal and milk sounds good when you’re rushed and you just need something to keep the kids busy, right? But thanks to the surplus of refined carbs and lack of protein, sugar cereal is one of the least filling breakfasts imaginable. 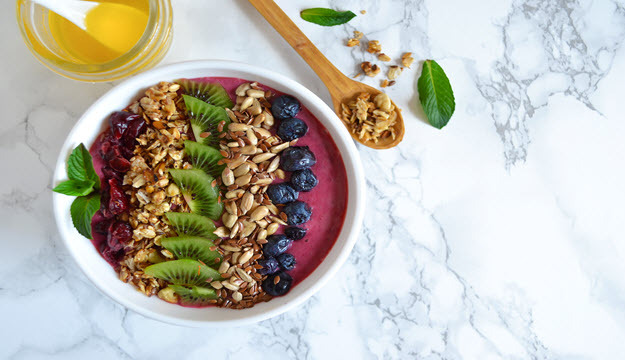 Use these four tried-and-true tactics to make your mornings easier and to ensure that your whole family begins the day packed with the nutrients they need to learn, work, and play well—starting with yourself. A bowl of sweet cereal and milk sounds good when you’re rushed and you just need something to keep the kids busy, right? But thanks to the surplus of refined carbs and lack of protein, sugar cereal is one of the least filling breakfasts imaginable. An hour later, you’ll all be hungry again. Say goodbye to cereal and try these make-head breakfast ideas! Overnight oats: Combine thick rolled oats with a liquid like almond milk at a 2:1 ratio of liquid to oats. Mix in a sweetener like ripe mashed bananas, stevia, honey, or maple syrup, stir well, then leave it in fridge overnight to soften. Stir again in the morning and top with fresh fruit, and you have a healthy, delicious breakfast that will keep you full all morning. Protein muffins: Craving a hot breakfast but don’t have time to cook in the morning? Prep protein muffins once a week and store them in the fridge or freezer, then heat them up in the microwave for a warm, filling start to your day. Try a super healthy muffin recipe like these Chocolate Protein Muffins, using ground oats as flour, Juice Plus+ complete chocolate protein powder for extra protein, and bananas as a sweetener. Smoothie bags: Overnight oats and protein muffins are a great start, but it’s also important to get your fruits and veggies. When you’re short on time, a smoothie can ensure you get the micronutrients and fiber you need. Try smoothie bags! Sometimes, life with kids is just too crazy and a leisurely, healthy, homemade breakfast is just not going to happen. No problem—that’s why you have some good, healthy, grab-and-go snacks on hand! You can prep your Complete shake for the road by putting single servings in small ready-to-grab storage bags, or storing them in the powder compartment of your shaker bottle. Other great snacks to have on hand include string cheese, baby carrots, fresh fruit, hard boiled eggs, homemade granola, and nuts. This last tip is the most important one: take care of yourself, and it will be much easier to take care of everyone else. One great way to do that is to wake up early and take some time for yourself before the kids are up. If you can get to bed at a reasonable hour so you get enough sleep, try waking up thirty minutes early and see how it goes. Enjoy your morning coffee or tea in peace and quiet. Journal or read for a couple of minutes. Ignore email and social media—those “urgent” messages can wait. Focus on the things that truly bring you joy and help you feel less stressed. That way, when the kids wake up and it’s time to begin the whirlwind of your day, you’ve already made time to nourish your own soul first. What tips do you have to make mornings easier? Share with us in the comments!